Acknowledged author Geoffrey P. Kramer wrote Introduction to Clinical Psychology (8th Edition) comprising 528 pages back in 2013. Textbook and etextbook are published under ISBN 0205871852 and 9780205871858. 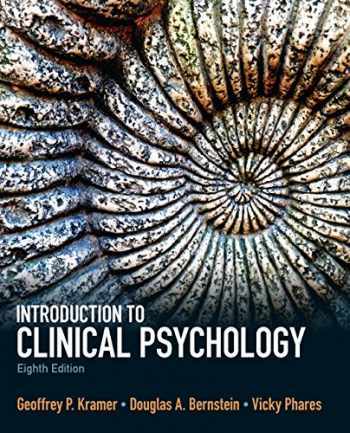 Since then Introduction to Clinical Psychology (8th Edition) textbook received total rating of 4 stars and was available to sell back to BooksRun online for the top buyback price of $73.37 or rent at the marketplace. The most current research and approaches to clinical psychology . Designed to provide a thorough survey of the field, Introduction to Clinical Psychology, 7/e is accessible to all types of students. This text presents a scholarly portrayal of the history, content, professional functions, and the future of clinical psychology. Extensive use of case material and real-world applications illustrates each theoretical approach. This text is available in a variety of formats — digital and print. Pearson offers its titles on the devices students love through CourseSmart, Amazon, and more. Learning Goals Upon completing this book, readers will be able to: Understand the history, content, professional functions, and the future of clinical psychology. Apply theoretical concepts to real-world clinical psychology.